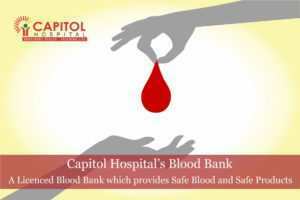 The blood transfusion department at Capitol Hospital offers a range of tests and services to ensure the safe and effective use of blood components for patients like red cells, platelets and plasma. The laboratories undertake the full range of blood group and antibody identification and provide appropriate blood for transfusion to patients. We also undertake monitoring of blood groups and antibodies in pregnancy andspecialized management of patients with complex transfusion needs. Blood bank is available 24 hours through the year. The most common type of donation, in the form of ‘whole blood’ is taken. The blood is separated into transfusable components – red cells, plasma and platelets. This type of blood donation usually takes about 8-10 minutes. If a patient needs blood, there are multiple types of blood replacements available. A doctor can take a call on what type of blood replacement will be given. Platelets are obtained from the donor by apheresis process in a safe & controlled system.